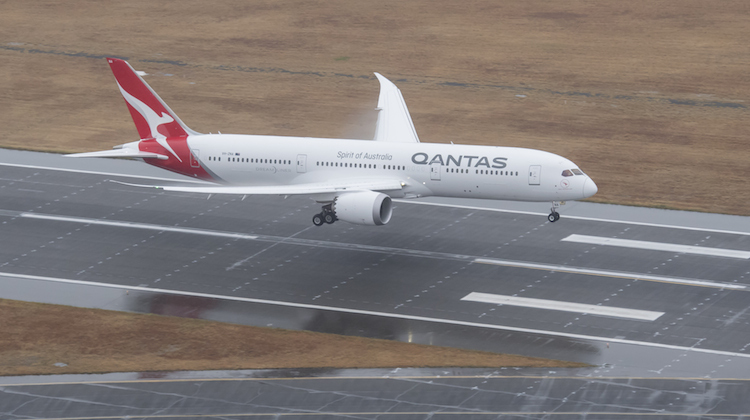 Qantas chief executive Alan Joyce says touchdown of the airline’s first Boeing 787-9 represents something of a rebirth of the 97-year-old Australian flag carrier. The aircraft, VH-ZNA Great Southern Land, landed at 0700 local time on Friday morning, after its 10-hour delivery flight QF7879 from Honolulu, Hawaii. After a short wait, the 787-9 was towed to Hangar 96 at the Qantas jetbase, receiving an Airservices Aviation Rescue and Fire Fighting (ARFF) monitor cross on the way. 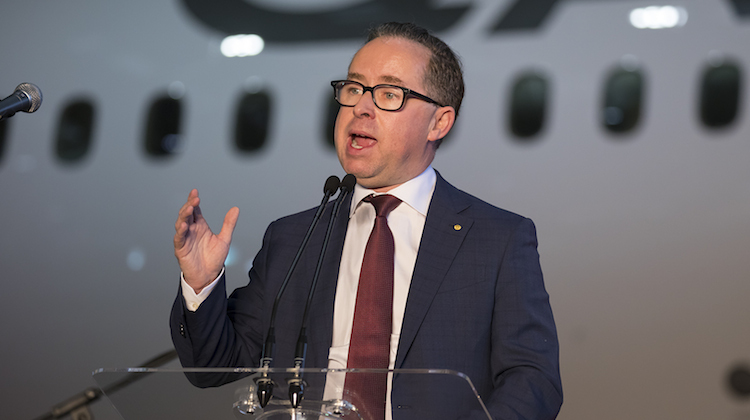 About 1,500 people were inside Hangar 96 to greet Qantas chief executive Alan Joyce, airline staff, invited guests and journalists stepping off the flight from Honolulu. Speaking to the crowd after disembarking the aircraft, Joyce hailed the end of what has been a long wait for the first 787 to appear in Qantas colours, given the airline first ordered the type in 2005. “The moment has finally come,” Joyce said. “This in some way to me is a bit about the rebirth of Qantas. Further, Joyce said what Qantas had done on its 787-9 passenger experience represented the best of Australian talent, given industrial designer David Caon’s work on the seats, the University of Sydney’s Professor Steve Simpson’s work on the science of long-haul travel and chef Neil Perry’s efforts on the food. “This is an amazing aircraft because of all that talent,” Joyce said. 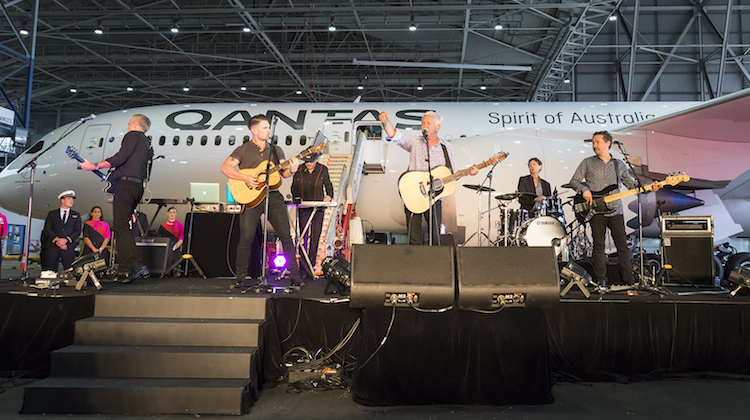 Those in attendance were also treated to a performance of the iconic song Great Southern Land from Australian musician Iva Davies, who was on the delivery flight from Seattle, and his band Icehouse. The arrival of VH-ZNA was the culmination of a near week-long series of events that started with the official unveiling of the aircraft at Boeing’s Everett facility on Monday (US time), including the naming of the aircraft Great Southern Land. On Tuesday, the 787-9, which is configured with 236 seats across business, premium economy and economy, took off from Paine Field, landing in Honolulu, Hawaii, some five hours later. The aircraft, and travelling party, spent the night in Honolulu before departing on the final leg of the journey to Australia just before midnight (local time) on Wednesday. 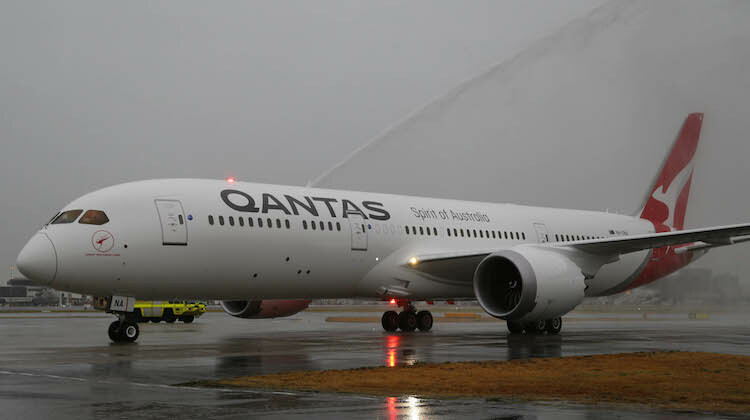 Some 10 hours later, the city of Sydney welcomed the first 787-9 to be operated by an Australian airline with showers and overcast conditions. 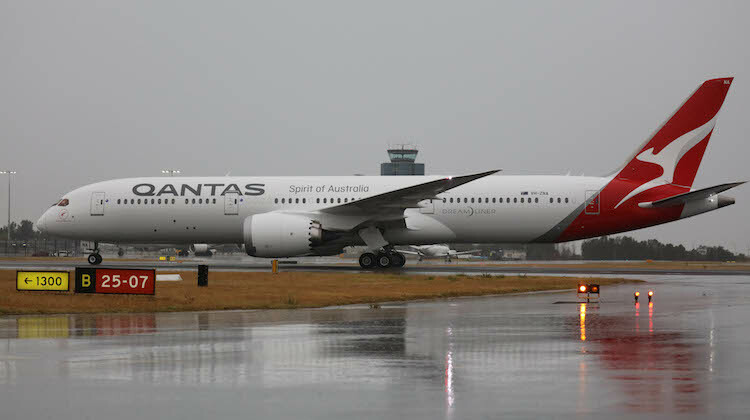 Qantas has ordered eight 787-9s, with the first four to be based in Melbourne and operate via a Los Angeles-Mebourne-Perth-London Heathrow pattern. The second batch of four will be based in Brisbane, with two used to replace the Boeing 747-400/400ER on the Brisbane-Los Angeles-New York JFK route and two to open up a new route. It is understood VH-ZNA would be in Sydney for a week before flying down to Melbourne. 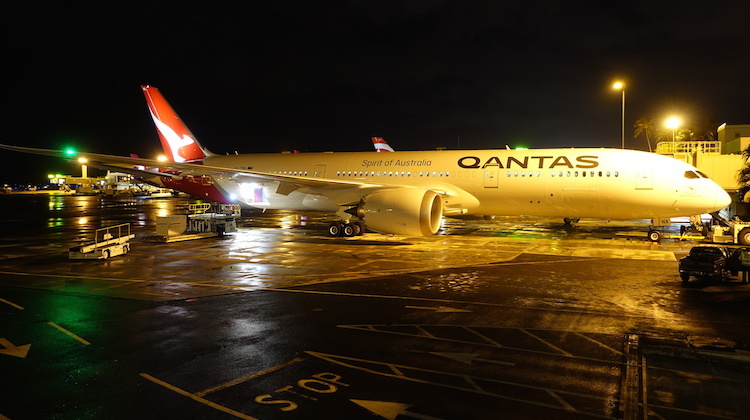 The aircraft will be used on some domestic routes from Melbourne to Perth and Sydney ahead of commencing long-haul operations in December. Looks amazing! I can’t wait to see it over here in the West. In my opinion no matter how much technology you put into an extraordinary plane, 17 hours is still a very long time to spend in a 60m long tube. Can’t wait to see her come to Melbourne. Having done over 17 hours in economy in an A380 to Dallas from Sydney and coping extremely well, I don’t see 17 hours in economy in a B789 being that bad. I am 6’1. As a premium airline, I see that they have abandoned their commitment to first class. Nice airplane I love it. I dont like Joyce, but this is a good move by Qantas; and once again, proves to be miles in front of Virgin! Surely you jest, 787 Y seats (bar JAL) have noticeably less seat width than an A380 Y seat. They are poles apart when you have been sitting in them for 12+ hours. Agree, A380 seat is wider and more comfortable than any 9 abreast 787 seat! While seat width is important to comfort, some Airlines I have flown on recently, seem to be reducing the padding to the bare minimum? These seats then become very uncomfortable if you have to sit in them for long periods! The media coverage of this is quite amazing. You would think QF is the launch customer and first to operate into Australia the way this is being portrayed. Other airlines have been operating the aircraft for years here already, the livery does look very nice on this airframe though. The 17inch wide Economy seats are going to be very tight, they are the narrowest width of any Australian airlines long haul aircraft, but it’s the newest! This plane is absolute beauty. Looks amazing couldn’t get any better. what commitment to first class ? Scott, the media coverage has been amazing because Qantas knows how to do promotions and media management. They are the benchmarks! The actual delay in the arrival of this aircraft represents the failure of Joyce as a CEO. Qantas still has too many configurations of aircraft and again a failure of the overpaid Joyce. The sooner Joyce is gone the better..
it’s a 787, for goodness’ sake! there are many others in service already around the globe. yet because it’s a qantas 787, all of a sudden it’s a big deal. yet another opportunity for Joyce grandstanding. compared to modern qantas, Eva Air is by far and away the better airline. Way to go! Only four years later than Jetstar. Scott, QF had Jetstar as the launch to first build up its A330 stocks without extra cost while looking at any possible issues on the 787 without the loss of face of the mainline entity having to deal with it, also while lowering JQs costs, also while maxing out depreciation on the 747s. Seems a wise move to me. The A330s went to JQ as they were starting international services and they were not going to be using unreliable 767-300s as they put it and they took QFs A332s delivered in the 2000s to cover the delivery delays of the 787 so not sure what your talking about in building up A330 stocks.Why did a business case have to be put forward for the 789 before it was ordered for mainline when the 788 was always earmarked to go to the low cost carrier. That plan does read very very sound. That looks like a great strategy, QF obviously has done a fantastic job if it worked out the way you explain. However the current hysteria in the Media and all the song and dance, about the launch is way out of step with commercial reality. Air Nz, Etihad, JAL, ANA, Royal Brunei, Vietnam airlines and many more have been operating this airframe to OZ for years. I understand the 330 bit your saying they came back to QF from JQ to build the numbers up while they got 788’s. Unreliable 763’s? really??? What’s your basis for this? @ Andrew Stone You clearly don’t know the history of the Qantas B787 order. When the aircraft was originally ordered, the first aircraft (B788) were to go to Jetstar so the A332 aircraft could return to the mainline fleet. When the B789 was available, they first 15 would go to Jetstar and the B788 would be transfered to Qantas mainline. With the delays in the program and the Qantas Board decided that debt needed to be paid down and Qantas International, which had been losing hundreds of millions yearly, had to be fixed before any new aircraft would be purchased for Qantas International. So apart for the aircraft on order for Jetstar (15 down to 11), the remaining firm orders were cancelled. 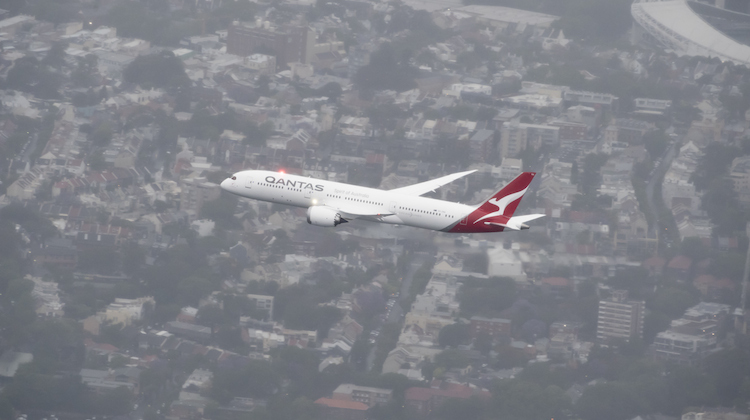 Qantas Board and Management stated that once International was returned to profitability, a positive business case, and an acceptable pilots agreement, Qantas would order the B789 for Qantas International. This is what happened and so the aircraft have finally been purchased. This would not have been possible if nothing was done to the cost base and other facets of the business. The partnership with Emirates has contributed to the turnaround of the international arm. On that score, I would say that Joyce has done exceedingly well. I fail to see you argument on aircraft configurations and how it is a failure. Re the hysteria around the arrival. 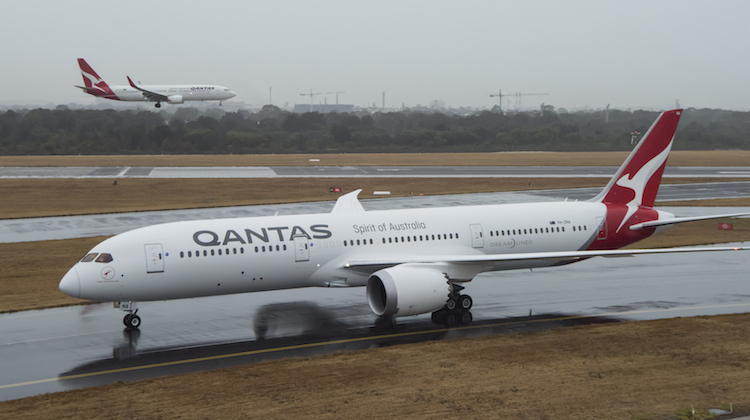 The press and others seem to neglect the fact that Qantas see this as a game changer principally because of the range, fuel savings and route opportunities not currently available. As for those who say the seats are too narrow compared to the A380, according to the seat guru, the Qantas A380 seats in economy are 17.5″ wide compared to the 17.2″ on the B789. Did you work on them mate?During line turnarounds they consistently had incoming defects and an ancient IFE system and substantial defect rectification on the overnight services.Read about the examples that went to Westjet and the issues they have had with them.Not what a low cost carrier bases their operation on spending bucks on maintenance.Thats my basis. No welcome to Adelaide. Might see it overfly our city on way to Perth catching the jetstream. So long Great Southern Land. Hello Qatar, Emirates, Malaysian and Singapore who call Adelaide “home”! It looks great even with that abomination of a rat on the tail…but 17 hours in a hard, narrow 17 inch wide cattle class seat at 9 across is just awful …no amount of Joyce’s rhetoric can enhance that. Give me an A380 any time. Great to see the 787-9 finally arriving. Hopefully QANTAS can now look at improving Frequent Flyer and Customer Services operations which are very poor. It was a great plane to fly on from L.A. to Melbourne, but United didn’t put in seats that let you snooze. The seats on the QANTAS A380 were fine for that …I think we all dozed off before we reached Hawaii and didn’t wake up until Fiji. BUT if one of you here flies on the Qantas 787 can you let me know if they put in the sky camera on the tail the way I asked QANTAS about. I doubt if they did. .
What I don’t understand is why it was received in Sydney when the whole fleet is going to be based in Melbourne and Brisbane. Wot the? Sydney certainly is Qantas Central. It’s pathetic! Given that Jetstar (Qantas) has had the 787-8s for four years now, I don’t see what all the “hoopla” is about. Who wants to spend 4 hours flying MEL-PER and then another 17.5 hrs flying PER-LHR and get all excited about it being a non-stop flight from Oz to Ol’ Blighty! Not me! I’d rather opt for SIA out of CBR on a B777-200 thanks and then SIN-LHR in one of their A380s with the exemplary service that goes with it! Alan – Last time I checked QANTAS has corporate HQ in Mascot, hence the ceremony in Sydney and before you gripe about me being a Sydney sider, I live in Adelaide. The ‘hoopla’ as you call it surrounding the B7879 is that it will be a game changer for QF, yes JQ have operate it for a number of years; however, this aircraft will reset the goal posts for QF. Happy for you to fly SIA from CBR and kiss your knees all the way over. The least amount of legroom I have ever experienced in Y has been in SQ and MH. Thanks Gary, but I’m sure I have read that the SIA B777-200s have 34 inch seat pitch, as opposed to the new B787-9s for Qantas only having 32 inch pitch (and 17.2 inches wide). 8.5 hours to SIN would be preferable to 17.5 hours to LHR on those figures. 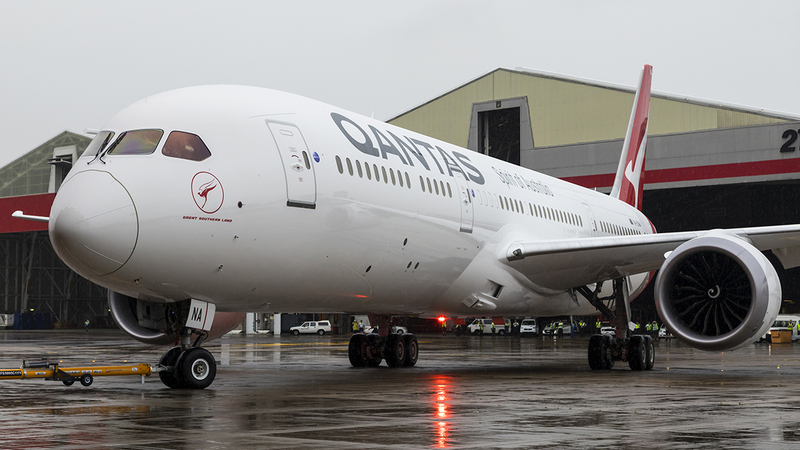 I think the only “game changer” about the B787-9 coming to Qantas will be for Qantas itself, not its pax. Still, I’m just an armchair whinger. I’ll probably not get a chance to fly in one now and if I did I would probably opt to fork out for Premium Economy! (Shame Adelaide is missing out on them too). Cheers! 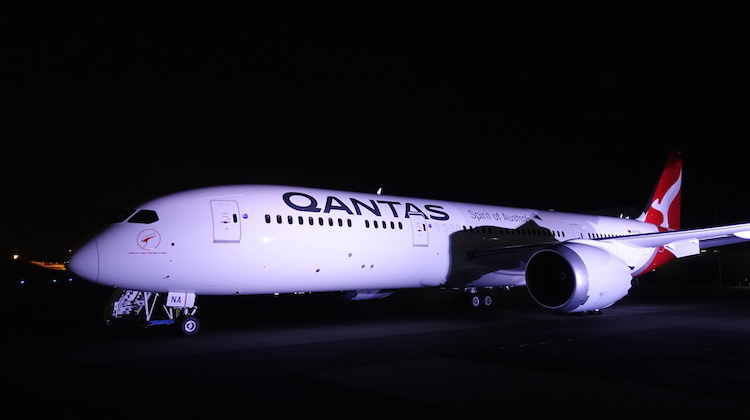 The 787’s Australian tour, will Darwin get to see this aircraft. Better late than never I guess. QF must be the last airline on the planet to finally fly the Dreamliner. Maybe it’s a Snoozeliner at QF because its taken so long.